This device works with iPhone 3GS and earlier, and iPod Gen 3 and earlier. If you have a newer Apple iOS device, see the all-new iAudioInterface2. Studio SIx Digital is now selling our professional-grade audio measurement and recording accessory for the iPod touch. 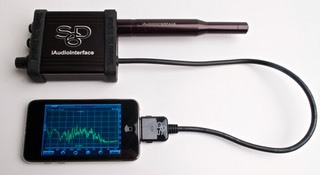 iAudioInterface allows the iPod touch (1st, 2nd, and 3rd generation) to be used for serious audio and acoustics measurements, and can also act as a general-purpose high-quality stereo line in / line out audio interface. iAudioInterface is designed to work on iPod touch. See our compatibility page for information about exact models. Audio Test & Measurement like a calibrated SPL Meter, both analog and digital, an SPL LEQ graph, an RTA, FFT Analysis, Impulse Response, and now available: Smaart Mobile and Transfer Function. Line Input Tests, including Level & Frequency Measurement, a dual-channel Audio Scope, a VU / Peak Meter, and THD+n Measurement. Speaker Tests, like Speaker Polarity, Speaker Distortion, an Impedance Meter and an Impedance Sweep. Utilities include our Generator, Mic Monitor, the ability to transfer files to PC / Mac, an Audio Calculator, and comprehensive Setup & Calibration. See our product warranty policy.